Check the scallops and remove the abductor muscle (it is a small, lightly darker bit of scallop meat on the side that pulls off easily). Heat the butter in a nonstick pan over a medium high heat. Add the scallops, and sprinkle with salt. Cook for a few minutes on each side, until just golden. If the scallops begin to crack you are overcooking them so take them off the heat. 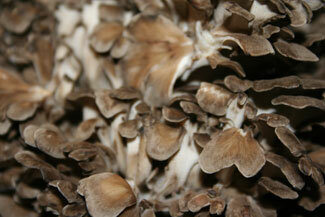 Place a couple of tablespoons of marinated maitake on a plate and add the scallops. Garnish with a grind of black pepper.